This wine fridge is elegant and sophisticated, featuring a beautiful black finish that will make a statement in your kitchen or workspace. 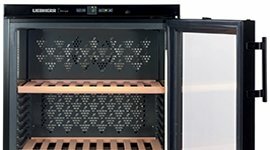 Perfect for anyone who wants to give their kitchen a lift, this unique and highly functional wine storage fridge will transform your kitchen into a dynamic space where you can entertain your guests. So if you’re looking for the perfect way to store your wines that won’t take up too much space in your home or workplace, don’t go past this Lemair 117L wine storage fridge. The maximum temperature for this fridge is 18 degrees, while the minimum temperature range is 7 degrees. This fridge features adjustable metal shelves, allowing you to configure the fridge to suit your needs. A tinted double glazed door ensures minimal exposure to harmful UV rays, ensuring the quality and depth of your wine is maintained. Purchased to replace old one that gave up the ghost. Excellent product and great service & delivery time frame. Recommended to family & friends. Large capacity of 40 bottles for this size with stacking required on a few of the shelves. 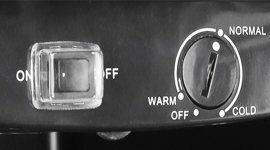 Good temperature when knob is turned to setting, just that the front glass get fogged up whenever door of chiller is opened and closed. Glass door is transparent, not tinted. Noisier than expected. Lack of temperature indicator a serious omission. Otherwise performs well. Firstly, one of the shelves is missing and I still haven't received one. Secondly, there is so much condensation on the glass door that my floor is always wet and secondly I have it on the lowest setting and it still won't go below 10 degrees and there is a huge ice build up on the back wall, but maybe this is normal for a wine fridge?? The fridge is perfect for a small space and holds so many bottles. I was very impressed with the delivery experience which was fast and efficient. Would definitely recommend! Great service at excellent price. The Lemair LWC59 Wine storage is just what I wanted - keeps my wines at a constant temperature in a garage which varies in summer between 18 degrees overnight to 40 degrees on a hot day. I bought the lemair wine fridge online as the price was more competitive than anywhere else I had looked. I did have reservations about buying online because of the usual uncertainty about delivery. However, the customer service, up to date shipment notes and delivery guys were exceptional!!! The product itself is fantastic! It looks sleek, temperature is perfect and itâ€™s very quiet. I am extremely happy with the process and the product. Good value for normal everyday use. Overall I am pleased with the product. I have set the temperature much colder than on Normal. I like the many shelving positions available. It seems quiet with little or no vibration but it is on a concrete balcony. It can hold heaps of bottles (59 are shown in the manual ?? Download it.) though those at the rear with necks facing you are impossible to read. Small price to pay for ageing better reds! Internal light is helpful. Trendy appearance too. The fridge is good but we were disappointed that it holds much fewer bottles than we expected. The capacity is based on French wine bottles which are apparently smaller than the average Aussie bottle. Delivery was fantastic. On time and we were kept up to date on progress. Very disappointed with the fridge. I purchased the fridge for an event and it just didn't get at all cold. I served warm drinks. The inside back of the cabinet frosted over but that was all. The cabinet didn't get cold at all. Lemair LWC59 40 Btls Wine Storage Cabinet. The product was as advertised and works great. Looks good and the delivery people were excellent. Prompt and very polite. The size of the fridge was abled me to clean up all my wines laying round on half boxes etc. Its a great size and works very well. As a very old bloke, I found regular defrosting of a very old bar fridge to be a real pain. The Lemair has eliminated this chore and does a great job cooling bottles. I bought this one because it was the cheapest available. I don't regret the purchase, because I wouldn't want to spend much more than I did, but there are a few issues with the design of which people should be aware. First, the shelving design is inefficient. The bottom two shelves are designed differently to all others, and leave an odd gap on the right-hand side. I'm not sure what that gap is for, but it it doesn't work well for storing wine bottles. If the bottom shelves were designed better, you could fit another four or five wine bottles in the fridge. Second, the shelving design makes it hard to access some bottles. The fridge is deeper than it is wide, and to maximise the number of bottles in the fridge, you need to have two overlapping rows of bottles on each shelf. So on each shelf the back row of bottles have their necks facing out, and the front row of bottles have their necks facing in and sit in between the necks of the back row of bottles. This keeps the fridge shorter and narrower, but makes it difficult to view and access the bottles stored up the back. I'd prefer a taller fridge with only one row of easily accessible bottles on each shelf. Third, the temperature gage is mechanical, not digital, and so it's difficult to know what temperature the fridge is at. There is no display or anything to tell you the temperature: just a setting of low, normal or high. I'm not sure what temperature low, normal or high refer to, or whether setting the dial to somewhere between normal and high would result in a medium high temperature. I knew this about the fridge before buying it, and considered this a reasonable sacrifice for the cost savings. But still, it's something to be aware of. I've been playing with it a little but haven't been able to make much difference or find an optimum temperature yet. As others have mentioned, it does make a bit of noise when the coolant flows through the fridge, but I don't find the noise unpleasant, annoying or distracting. Very happy with this appliance, I use it to hold around 30 bottles of wine with space left for other drinks in cans and small bottles, this suits my needs. Maintains great temperature and doesn't take up a lot of space in my kitchen. very satisfied, good product,enjoyable drinking temperature. Every thing in the design is good. Motor rattles every time it turn off annoying. Having eventually managed to return a much more expensive faulty Vinovault from a different supplier (which I would NEVER buy again), I wasn't sure what to expect with my second wine fridge purchase. I have now owned the Lemair for a couple of months and it has reliably kept my wine and beer cool. Not cold, but the temp only goes down to 7 deg, and it seems to be consistent at this level, so both products are chilled enough for the first sip. It gurgles and whirrs occasionally as the coolant moves around, but is generally quiet. The wire shelves are brilliant - much better than the wood which just gets mouldy. Even in the warmer temperatures, I am not experiencing condensation on the glass door. Overall, very happy. Great features and it looks good. Very happy with the purchase. Not sure about the fact it states it holds 40+ bottles, mine now has about 35 and it's at capacity. Had this for a few months now and quite happy. Looks good. I'm using it for wine, beer and mixers. Removed the bottom tray to fit in the beers although that works better with a solid placemat or similar to flatten out the rippled base. Champagne and soft drink bottles don't fit really well and mean you can't get anywhere near the stated capacity (which must be for wine bottles only.) Some reviews talked about the noise but I really don't notice it much. It's near my bedroom but is a low hum. It has frosted up on the back wall quite badly which reminds me of my childhood and the periodic "defrost" by opening the door and turning it off. For me, it was ore about the physical size and not paying a bomb for some of the elite wine and beverage options. As always, the AO delivery folks were spot on with customer service. I purchased this item a few months ago now, It is fabulous however I miscalculated the amount of wine I needed to store. I really needed to buy two or buy a larger one. It fits neatly under bench and is asthetically very pleasing. I would happily recommend it. It does the job - just! The Lemair wine storage cabinet does the job, but the themperature setting range is inadeqaute and seems to be unreliable. I have it set on the warmest possible setting to achieve the required temperature for red wine. This appliance seems to work fine but the outer cabinet gets very hot to touch while it is running. Excellent delivery service! Was called early in the morning, boys arrived quite promptly and plugged in the machine to be sure it was working. Packed up all of the disposable material and took it away. I bought this about a month ago on a super special $327.It is of simple construction but seems to be doing its job. The sides of the cabinet get a bit hot when the motor is running. We managed to get 45 bottles in it. Quite happy we made the purchase. I purchased this unit a couple of months ago ,so far so good.After purchasing 2 vintec units in the past and both only lasting 3 years I'm hoping this unit will last longer .i do have a seperate thermostat to check temp as this unit does not display temp and it is consistent . Chromed racks take more bottles than expected, temp control is simple and effective. Plug in and let it do the job. Like Appliances Online:: no problems. Have had this now for over 2 months. Just wanted something (of these overall dimensions) for cans, stubbies, the odd bottle of wine and some cocktail mixers. (Sick of my main fridge being full of drinks.) It's very much tailor-made for wine bottles so I've had to remove some shelves and sacrifice capacity to fit in the normal 1.25 litre bottles. You end up only using every 2nd slot. There were some comments about the noise. It's not far from my bedroom and yes, it can gurgle a bit here and there, but not any great concern to me. Have noticed the internal rear wall has started to frost up despite being in the mid range of temps. Like the glass front but only turn the light on for parties. Price is great compared to the more commercial-looking non-wine products. Happy enough with it for the price. Perfect size and chills well! Bought this approximately 6 weeks ago and happy that I did. Fits perfectly in the spot put aside for it and it looks good. 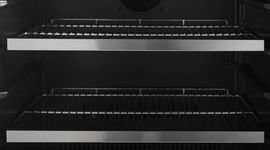 The Lemair does the job it is supposed to do - it allows you to store a reasonable number of bottles in a temperature controlled environment. The downside is that it is quite noisy - much noisier than my regular refrigerator. So if you plan on buying this wine fridge, make sure you have somewhere out of the way to locate it (mine now lives in the laundry). If you want it on display in a living area, you might be disappointed. Was concerned would not be cold enough to add the odd beer bottle and soft drink but definitely cold enough. Pleased with look and dealing with the great team at AOL. Thanks guys.